London Islamic School students were treated to a coaching session run by West Ham Community Sports Trust with the aid of Hollywood Actor and former footballer Vinnie Jones, held at the abandoned Shoreditch tube station in East London to launch ‘Tackling it Together’, a new programme from the n-power Football League, which aims to tackle anti-social behaviour in young people through football. The day commenced with each of the students being given hooded tops as a gift to wear during the session to fit the urban makeover given to the abandoned Shoreditch tube station. With their urban look, they received an inspirational talk by hard man Vinnie Jones who spoke about how football was a means for him to stay out of trouble in his youth and how young people today are provided with ample opportunities which they need to access in order to abstain from the anti social behaviour which surrounds us. The students also had the privilege of being in the company of the MP for Bethnal Green and Bow, Rushanara Ali who shared words of wisdom with the students about her academic experiences and how students should have high aspirations and aims in life to achieve big things and how the sky is the limit, just as Vinnie Jones reached a peak in his life from Footballer to Hollywood acting due to his hard work and talent, similar is the case with Rushanara Ali and the academia which has lead her to be MP. 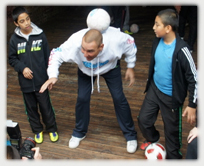 The students were then given star treatment with an entertaining coaching session conducted by West Ham Community Sports Trust with the aid of Vinnie Jones and the ‘Tackling It Together’ Ambassadors’ while being under the spotlight with the national media present from London Tonight, The Metro and Sky Sports News. The day then ended with a short football game for the young people to enjoy and pictures taken with Vinnie Jones as a memory for the young people’s experiences. The programme was aired on London Tonight and Sky News.